Slovenia is a small country in the heart of Europe often overlooked by mass tourism. Best known for incredible natural beauty, its magnificent mountains and natural sceneries. Diverse landscape with turquoise-green rivers, alpine lakes and numerous tourist attractions impress more and more tourists every year. Slovenia is also one of the safest countries in the world. Small size and good roads enable you to enjoy breakfast in the capital city, go for an afternoon hiking trip in the Alps and have a dinner with magnificent view on the coast. There are many things to do Slovenia. Take full advantage of its amazing lakes, magnificent mountains, blue-green rivers and other impressive sceneries. The spectacular views and landscapes make Slovenia perfect for adventure travel. Besides, there numerous resorts and accommodations, which allow you to enjoy your vacation experience even more! If you are looking for a perfect get-away this summer – Slovenia offers great outdoor fun activities for an active holiday! Soca Valley is one of the best scenic spots you will find in Slovenia. It provides a stunning backdrop to a wide range of adventure and watersport activities. As you Raft or Kayak down the Soca River, you will find alternating sections of crystal clear and deep green water. This is why it is commonly referred to as the “Emerald River.” The adorable nature surrounding the Soca River provides an active holiday paradise. 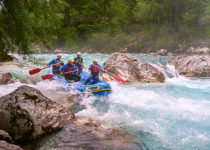 Find also other outdoor activities around Soča! Up for a challenge? – Get ready for the most spectacular Zip-Line descent of your life! 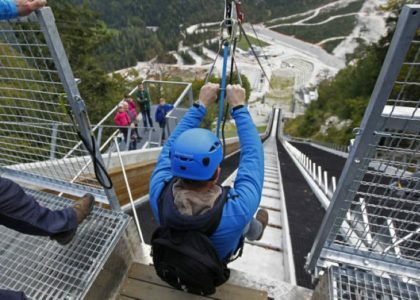 566m long Zip-line, flying over famous Planica ski flying Hill at a speeds of 85km/h! Experience the sensations of best ski jumpers in the world, on this world steepest Zip-line descent. Fly over the large hill and get counted among the legends who achieved a milestone of flying in Planica. When finished – go on amazing filmily hike in Tamar valley! Bled is the most visited touristic area in Slovenia. Renown for beautiful lake with unique island and amazing alpine scenery. You can decide to take a traditional ‘’Pletna boat’’ ride to the Island, but you could also decide for a more exciting experience by participating in Stand Up Paddleboard tour. SUP provides you with a new and thrilling way to explore Lake Bled and the island. 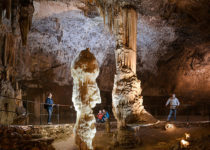 UNESCO World heritage site Postojna cave is undoubtedly, the main tourist attraction in Slovenia. It’s also the most visited underground cave system in Europe. 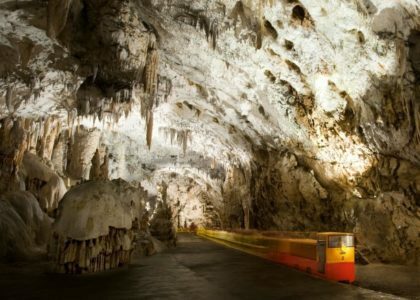 Here you can discover amazing system of underground geological wonders with 24 kilometers of underground Karst tunnels and halls. Don’t worry – Legendary underground tourist train will take you around the cave system, so thrilling experience is guaranteed. The cave has a constant temperature of 6 degrees Celsius, so be sure to pack some warmer clothes. Nonetheless, it is an amazing experience to remember years to come. Time to relax! 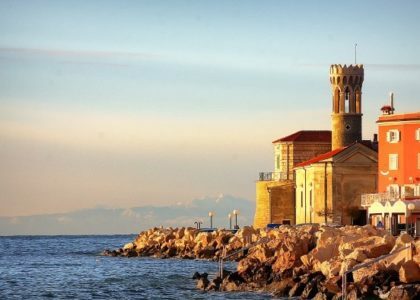 Slovenian coast line offers a perfect relaxation on Mediterranean sunshine. One of the nicest towns is Piran. The town is one of the most beautiful and one of the oldest towns in Slovenia You will definitely fall in love with this small and colorful town. Discover an amazing mix of cultures and traditions from Croatia, Italy, and Slovenia. Piran is also one of the most photogenic cities in the Mediterranean! Spend a day discovering hidden wonders of this amazing town and go for a short hike along the coast! 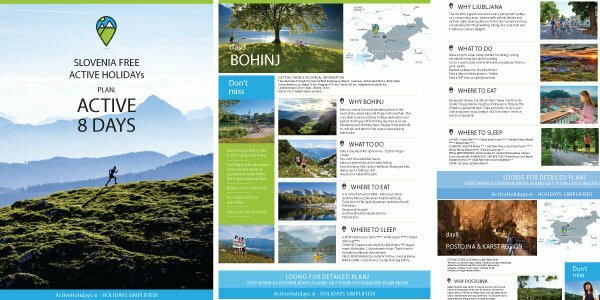 If you are an outdoor lover, then Bohinj is your perfect spot. Area is an ideal holiday destination and a perfect starting point for outdoor and hiking day trips! 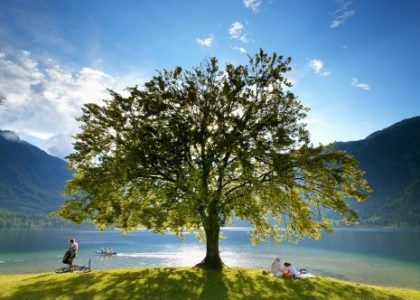 Amazing Bohinj Lake is the largest glacial lake in Slovenia. Here you will have a chance to enjoy wild yet relaxed swimming in the crystal-clear blue water. Bohinj is located in the central part of Triglav national park, so you will have a chance to see amazing views of the Julian Alps. Lake Bohinj is also a perfect starting ground for many adventure activities such as: Rafting, Canyoning, trekking, hiking or short walks. You can also engage in road biking, Mountain biking, rock climbing and much more. Bohinj is also an amazing place to chill out and meditate, just below the foot of the majestic Julian Alps. Vogel is a renowned ski area in winter and one of the fastest growing summer attractions in Slovenia. It’s located just above Bohinj in the heart of Julian Alps. Cable car will take you 1000 meters above Bohinj Lake, where you can admire perfect view of Triglav (Highest Slovenian Mountain). In summer Vogel is a perfect hiking playground, because you can easily access prominent mountains. If you are and adrenaline junky – try out Vogel Mountain bike park! Combine thrilling trails in high alpine are, with amazing natural beauty. It is the ideal destination for an overwhelming mountain biking experience. 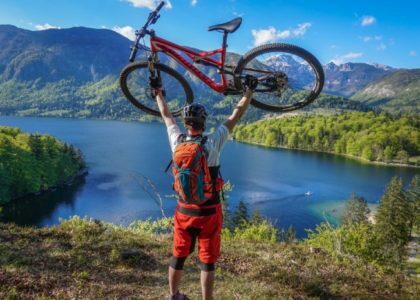 Trails are suited for all levels – Whether you are a beginner or an expert, the trails in Bohinj area offer amazing biking thrill. Truly unforgettable experience is Tandem Paragliding in Bovec! Bovec is located in the central part of Soca Valley. As result of excellent local weather and thermal wind conditions, along with high mountains, Bovec is a perfect area for paragliding. Don’t fear – Tandem paragliding is organized by professional guides with years of experience and is 100% safe! 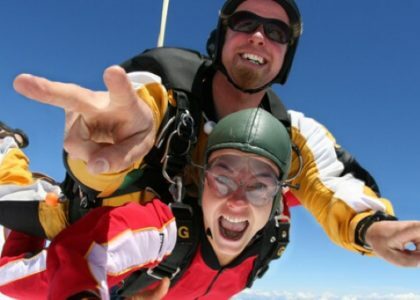 Decide for and adventure of the lifetime and experience first-hand the bird’s eye view of the amazing valley. Once in Soca Valley, you have to check amazing natural wonders: Boka waterfall, Spring of Soca valley, Great soča Gorge and much more! Kranjska gora is Slovenian summer tourism pearl. Fast development of this outdoor epicenter is based on amazing location in the heart of Julian Alps. Here you can find astonishing hiking trails, more demanding climbing options and biking playground. 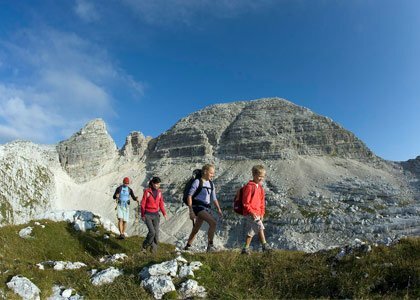 Around Kranjska gora you can find over 100 kilometers of marked hiking trails suitable for all levels and wishes. In the area you can also discover amazing alpine lake Jasna, Tamar valley and Vršič mountain pass. Kranjska gora also offers great touristic infrastructure. From 5 star hotels, glamping camps, to amazing apartments in nature and much more. It’s also a great place to taste traditional local dishes! If you wish to combine relaxing on the beach and good local cuisine with biking, then this is the tip for you! 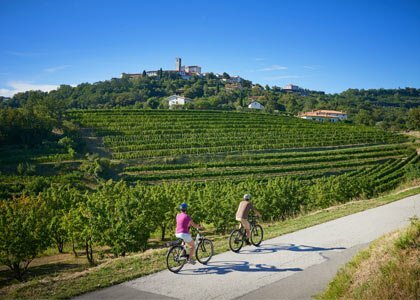 Slovenian Istria (costal part) offers amazing landscape with small Tuscany like hills and quiet road with no or little traffic. Discover hidden corners of the area with your bike. You can find many options: from easy panoramic loops perfect for family trips, to more demanding loops perfect for road biking enthusiast. If in the area you must not miss the charming Paranzana route. This dedicated biking track was built over old railroad track running from Trieste to Pula. Along the way you will discover amazing views and small local restaurants and caffes – ideal day trip idea! 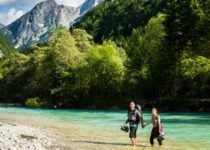 This are just some ideas on how to spend a perfect active holidays in Slovenia. You will definitely be impressed with this mall country! Decide for trip to Slovenia and discover stunning images of the glacial lakes and rivers, see amazing mountain landscapes and experience traditional culture in historic cities. 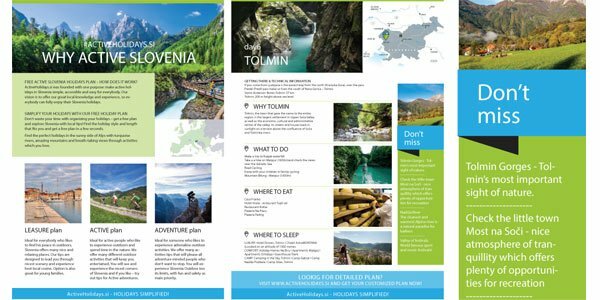 Slovenia is an adventure paradise! 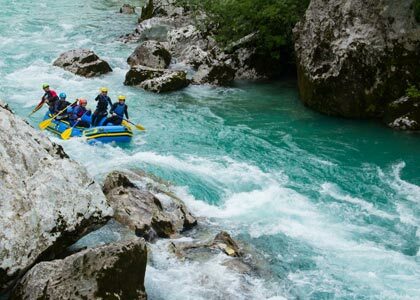 Experience best of what Slovenia has to offer and combine your relaxation with activities such as: adventure trekking, hiking, rafting, swimming, biking and many more. Still not decided? – Don’t waste your time with planning, just get your free Active Holiday plan!